Instant Imprints Mississauga | Custom T-Shirts, Embroidery, Signs and More! NEED MORE VISIBILITY FOR YOUR BUSINESS? At Instant Imprints Mississauga, our customers come to us when they want to be more visible to their customers. We create that visibility five different ways: Branded Apparel (embroidery), Signs & Banners, Promotional Products, Custom T-Shirts and Print Services. I can come to these guys for anything. Always find a way to make things work, deliver on time, and genuinely concerned with growing my business. I come to them for all signs, shirts, and promotional products. 2 THUMBS UP!! Is your business or sports team looking to step up its visibility with custom t-shirts, printing services, promotional products, custom banners or branded embroidery items? Then look no further than Instant Imprints here in Central Mississauga! We have what you need to craft superior promotional products, all under one roof. Best of all, our local Image Experts are happy to help you take your brand to the next level. Just ask your smart speaker, “Where’s the best print shop near me?” and you’ll be sure to find Instant Imprints! Instant Imprints provides an award-winning level of service combined with the personal touch of a local Image Expert. We work to understand the needs of your project and deliver you a superior final product. Our service is second to none, offering the latest production techniques at an unbeatable value. At Instant Imprints in Mississauga, we pride ourselves in getting your job done right the first time, and having it delivered when you need it. Make no mistake, there’s no better print shop around! There’s no doubt that custom t-shirts can provide a big impact for businesses of all sizes. Our custom t-shirt service is a surefire way to give your logo legs, helping you spread your brand message across the Mississauga community and beyond. You can use your custom tees to promote an upcoming event or memorialize a past one, with no limits to where your shirt can travel. Show off a new product or push your brand as a whole with a custom t-shirt design of your own! If you want to bring it to another level of class, our custom embroidery service presents your brand along with a sense of durability and quality. 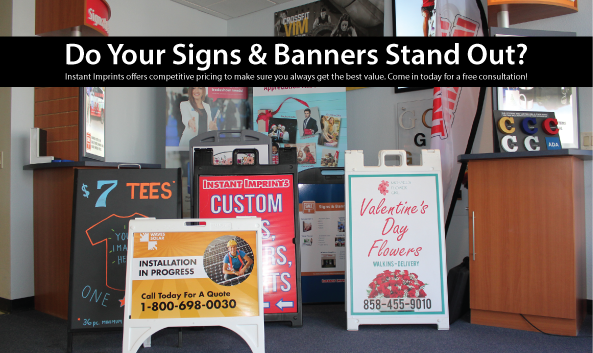 When your brand is looking to stand tall across Ontario, there’s no better way than with a custom sign or banner of your own. Our service can handle jobs of all sizes, from small sidewalk signs to massive business banners. Whether you’re looking to invite in passersby from the street or attract their attention from the motorway, there’s a custom sign or banner solution that can present your brand to them. If you have any questions about design features or materials, our local Image Experts are more than happy to help. Instant Imprints is your solution for promotional products of all kinds. Stop in at our Central Mississauga showroom, give us a call at (905) 267-2945 or request a quote online today!